The villa is located freely on a corner property, near all facilities and the sea and is very well furnished and tastefully equipped. It has separate cozy patios from which you can jump directly into the pool. The peaceful, central location and the seclusion of the property and the altogether 13 sleeping accommodations make this villa an ideal holiday option for large families that live separately, but want to spend holiday together, or also for families that want to be together and want to have new acquaintanceship. The 2 BBQs can be the meeting point and allow for a party atmosphere. The 2 patios and the 2 pool patios also offer an individual private atmosphere so that you can choose where you would like to lay down or sit. Behind the high stone walls your area will begin. The villa is well prepared for cooler days - with oil central heating. Highlights:: The villa is located only 3 minutes from the bakery and 4 minutes from the supermarket. The nearby centre can be reached without a car. The distance to the city is about 500 m. There are no high-rise buildings nearby, only private villas form the district. There is no through traffic. During the shoulder season, the villa is well prepared for cooler days - with warm water heating. The pool:: The swimming pool located on the side has a size of 10 x 4 metres and is about 2 metres deep at its deepest point. It is regularly maintained by the house janitor so that you can enjoy clean, well-kept water. Bed sheets and towels can be rented through the house janitor for a fee of 10 / 3 €. New modern mosquito nets and roller blinds are installed on all windows. All doors and windows are equipped with metal bars for your safety. It is about 500 meters to the beach - that is the distance from the Villa Laura, so it is easy to reach on foot. 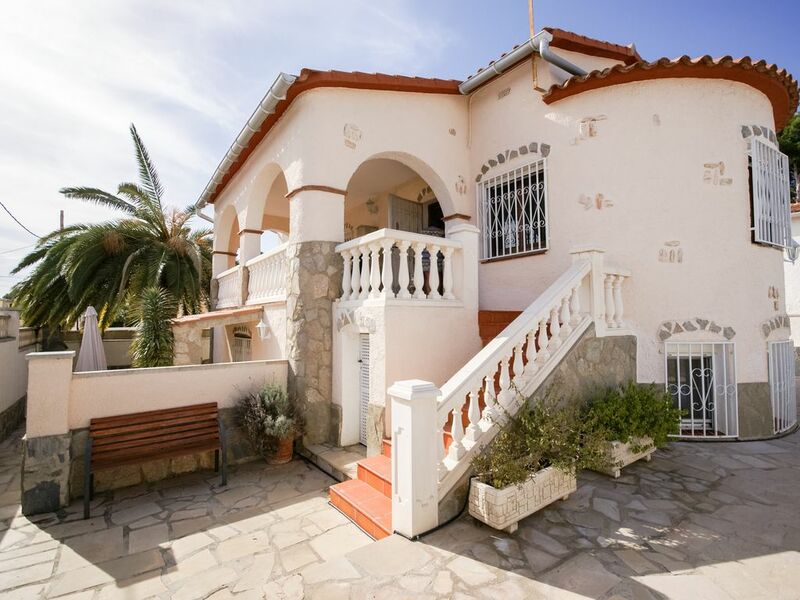 The villa is located peacefully in a beautiful part of town without high-rise buildings and through traffic, but it is still central enough so you can reach shopping facilities like supermarkets, newspaper kiosks or bakeries in a 3 to 4 minute walk (about 250 m away). Good restaurants and beautiful bars are nearby - here you can sit and enjoy. The peaceful villa area has great beaches and a lot of recreation activities. The villa is a good starting point for bike tours in the hilly back-country or in the flat beach region. 2 golf courses and tennis courts are not far away (3 and 7 km). Golf: Between two golf courses 'Bonmont' and 'Mont Roig'. From the villa you can reach the two 18 hole courses in about 3 km and the others in about 7 km.